World Tong-Il-Moo-Do Federation Vice President Master Takamitsu Hoshiko (Centre) saw a great potential for martial arts in Kenya at the conclusion of Tong-Il-Moo-Do Federation at Aga Khan Academy. Kenya has great potential and an unlimited opportunity to grow the disciplines of martial arts, Master Takamitsu Hoshiko, the Vice President World Tong-Il-Moo-Do Federation acknowledged. 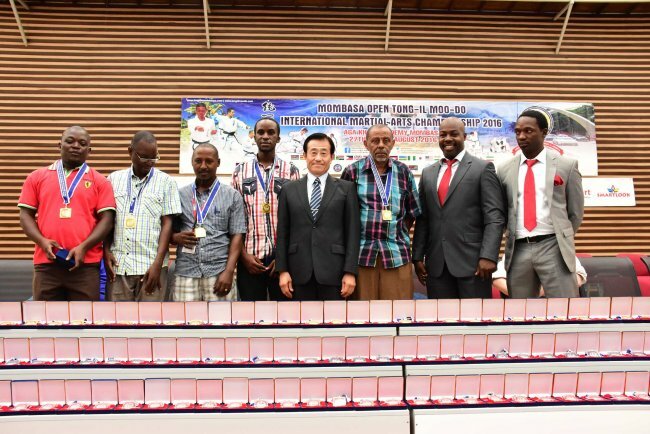 Hoshiko has been in the country for the past week overseeing the training of athletes and hosting of the just concluded the Mombasa Open Tong-Il-Moo-Do International hhampionship in which Kenya convincingly retained the title. This was in reference to Kenya's ability to, for the fourth year, successfully host the championship. Kenya retained the overall title in the two-day event which attracted an increased number of participants. This year, teh competition attracted a record 120 participants. Acting Director General Sports Kenya Gordon Oluoch stated that things have not always been rosy in martial arts but there is room for change. “A few years back tong-il-moo-do did not have sponsors and faced a lot of challenges. However, the determination and spirit has seen it grow and we are going to work keenly with the team going to South Korea to represent us to ensure that they are well prepared,” he said. The tong-il-moo-do national team is in camp to prepare for the upcoming the three-day Chon-Ju Championships to be held in South Korea from September 2. Head of the delegation Clarence Mwakio told Sports News Arena that sponsorship is a key factor when it comes to the tournament. “We have received substantial sponsorship from the Ministry of Culture, Sports and the Arts. Sports Kenya has also been supportive in our cause. With this kind of support we are sure that we can have successful tournaments in the future,” Mwakio concluded.